On behalf of the board of school directors, administration and staff, welcome to the Armstrong School District! 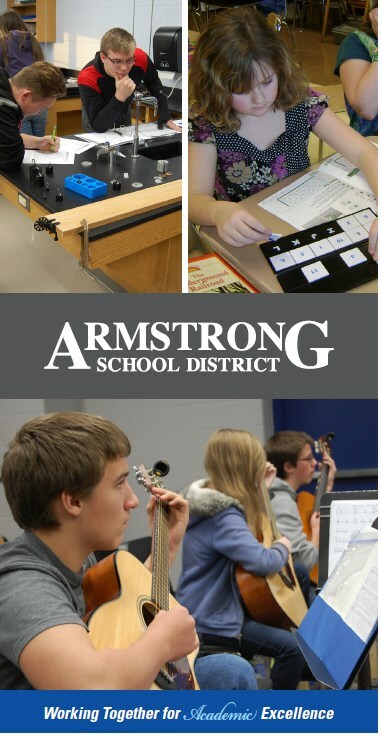 In this section of the Web site, we provide general information about the Armstrong School District. Please explore the links to the left to find out more about how we are Working Together for Academic Excellence. Our students are our future. Our highest calling is helping all of them to reach their personal best. Our passion is creating optimal learning environments and high-performing schools which will produce graduates who are ready to compete in the 21st-century economy. The Armstrong School District, in partnership with our families and communities, will graduate educationally prepared, productive, morally responsible individuals. Thank you for your interest in the Armstrong School District. Check out our school district brochure!